Home » Media » Meteorologist Michelle Bogowith Bio: Who Exactly Is She Married To? According to her twitter, a dog lover, world traveler, adrenaline junkie, sports enthusiast; the adventurous Michelle Bogowith is an American journalist. 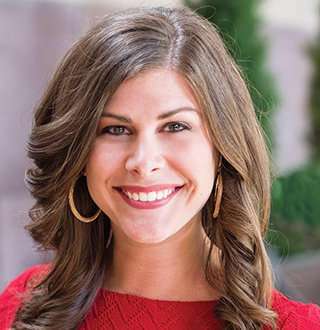 She currently serves as the meteorologist for WDAF-TV. Besides working as an on-air meteorologist she also likes to visit local schools and educate children about weather. Prior to her current position, she has worked as a meteorologist and fill-in host for KOMU-TV 8 as well. The gorgeous meteorologist celebrates her birthday every year on 6 January. Her birth year hasn't been disclosed yet which puts a question mark on her age. But with a beauty like hers, we can say she has aged absolutely well. Know more about: WCVB Reporter Kelly Ann Cicalese Bio: Husband & Family Finally Revealed! She grew up with her parents and brother Matthew. Since the family vacation in Gulf Shores, Alabama, at the age of seven, the young Michelle developed a fascination for weather after seeing a waterspout. And that’s how the younger version of her who observed the storms from the deck knew she wanted to be a meteorologist. Following her dreams, she pursued a Bachelor’s Degree in Atmospheric Science and Communication from the University of Missouri-Columbia. Later, she also graduated with a Masters of Science in Meteorology from the University of Missouri. How Much Salary Does Michelle Bogowith Earn As Meteorologist For WDAF-TV? The aspiring meteorologist started her career as a fill-in weather forecaster in 2007 for KOMU-TV 8. And subsequently got promoted to the serves as an Evening Meteorologist in Columbia, Missouri for KOMU-TV 8. From 2007-2012, serving for KOMU-TV 8 she bagged several awards for her work as well. She won Best Weathercast in 2012 and 2012 awarded by Missouri Broadcasters Association. Her phenomenal reporting during the tornado in Joplin, Missouri bagged her an Edward R. Murrow and a National SPJ Sigma Delta Chi Award. In September of 2012, she joined Fox-affiliated WDAF-TV as a mid-morning and noon meteorologist. With her hard work, she also achieved Certified Broadcast Meteorologist Seal in 2014. As a meteorologist for WDAF-TV, she earns an estimated average salary of $71,177. When it comes to her love life she is happily married since 2017 to her husband Gary Brown who is a general contractor. In an Instagram post, she also mentioned that it was the highlight of her year to get married to her best friend. As the wedding couples are best friends they probably met years ago and thank god escaped the friend zone and embraced each other. Best friends turned couples are always the cutest relationships! And talking about cuteness, her husband proposed to her in the most adorable way ever. In 2016 Halloween, the couple decided to have a pumpkin carving contest with together. Well. then guess what her husband ended up carving the pumpkin in shape of an engagement ring and what’s next, he proposed to her and she said YES!